Herzog’s film begins with a brief slow-motion shoot of a ski-jumper floating through the air, mouth wrenched open, imbibing the experience. The moment is perfectly complimented by a somnambulistic ethereal tune by the German group Popol Vuh, long time collaborators with Herzog. The title comes up, followed by the credit: “A film by Werner Herzog.” A second shot shows the Swiss woodcarver Walter Steiner at work, interpreting his art in a strangely disorientating manner. For someone who doesn’t know anything about the film, nor anything about Steiner, this is confusing. What are we about to see? A documentary about a primitive artisan, the last of his craft, struggling against modern society? From Herzog this is quite possible. But why the image of the ski-jumper? In 1972 and 1977 Steiner was the world ski-flying champion, and in 1973 he was placed second. These championships are held approximately every two years. He also won a Gold medal ski-flying for Switzerland in the Winter Olympics. Herzog’s film ostensibly covers Steiner’s mammoth record-breaking leaps made in Planica, Yugoslavia in March 1974. Here Steiner demolished all competition by achieving a perfect score, a feat never before achieved. Even more remarkably, Steiner handicapped himself by beginning on a lower run than his competition. Furthermore, Steiner equaled the world record jump set on a longer ramp. Steiner’s achievement was awesome and Herzog was there to capture the events. If Walter Steiner had not existed, Werner Herzog would have had to invent him. Steiner is the quintessential Herzog hero, an obsessed individual, so confident in his own abilities that he transcends the human condition, becoming answerable to no one except possibly God. Steiner is partially a Herzog creation, a myth conjured by the filmmaker. For example, the text over the slow-motion image of Steiner, alone, fading into a snowy blankness that serves as the coda for the film reads: “I ought to be all alone in the world. Just me Steiner, and no other living thing. No sun, no culture. Myself, naked on a high rock…. Then at least I wouldn’t be afraid.” This final statement was written by Herzog. The two non-skiing related interviews with Steiner included in the film – the one mentioned above where Steiner describes his work, and another featuring an anecdote wherein Steiner discusses the young, sick raven he had kept as a pet – have a strange, mystical quality, as though there is something profoundly metaphorical in what Steiner is saying and yet, we cannot quite grasp its meaning. Is Steiner comparing his experiences at Planica – where he became the supreme ski-flier – with those of his victimized bird? The mysterious associative logic found here is similar to that located throughout Herzog’s other work. Herzog lets us discover his special universe, a world of misfits with remarkable talents (such as his dwarves, the deaf and mute, Bruno S, Klaus Kinski and Walter Steiner) who are forced to become outsiders in our world. In addition, Herzog allows us to discover his world as the events unfold (the impending eruption of La Soufrière or Steiner’s record breaking jumps). It is almost as if Herzog himself is that extra ingredient that makes the magic occur. In The Great Ecstasy of Woodcarver Steiner, Herzog plays the naive, awestruck reporter, humbled by the supremacy of the ski-flier. But Herzog is also an intelligent, intuitive filmmaker. By 1974 ski-flying was reaching its limits, a fact acknowledged by Steiner in the film. Herzog states that the genesis of his film was in Steiner’s 179-meter jump and subsequent fall at Oberstdorf in 1973. This jump, 10 meters longer than the world record, was at the very extremes of ski-flying, pushing the sport to its most dangerous limits. If Steiner had jumped a further 10 meters he would have landed on a flat surface, experiencing a direct 110 meter fall and certain death. 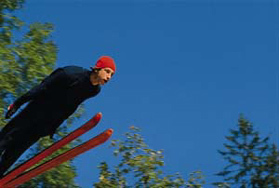 As already noted, by the beginning of 1974, when filming began, Steiner had already won and placed second at the World Ski-flying championship. Steiner was at his prime and was the individual most likely to test the limits of the ski jumps. Having deduced this Herzog began filming Steiner. Initially, at the Schattenberg ramp for the opening jumps of 1974, Steiner performed badly due to injury. According to Herzog, a defeated Steiner was ignored by the spectators. It was only once Steiner competed at Planica that the remarkable occurred. Apart from Steiner’s jump at Oberstdorf in 1973, Herzog doesn’t include any details of Steiner’s previous skiing career nor that of any of the other ski-jumpers. There is no attempt to contextualise Steiner’s achievement. He is portrayed as so determined to fulfill his ambition to fly that he almost metamorphoses – much like Luc Besson’s sporty protagonist in The Big Blue (1988), who becomes a dolphin – into a bird. The paucity of factual details makes Steiner’s monumental effort at Planica appear to emerge from a vacuum, making it seem even more superhuman. Herzog, the intrepid chronicler of the human experience, carefully builds the myth. The Great Ecstasy of Woodcarver Steiner is not a fast-food style documentary about a sporting personality, to be viewed once on television and then discarded, nor is it a cinéma-vérité style observational piece, slowly revealing some profound truth. Herzog is more interested in creating an enduring peon to a unique individual. Like a political filmmaker attempting to advance a contentious hypothesis, Herzog amplifies some aspects and ignores others in an attempt to present his case. Herzog’s most memorable films have a euphoric effect, making the audience aware of the full potential of life. In the worlds his films create and observe anything is possible and even achievable. For example, a simple craftsman can extend the limits of human existence. In Herzog’s oeuvre, this film, like the ski-flying abilities of Walter Steiner, ranks near the very top.